November 2018 saw the launch of the British Dietetic Association's (BDA) One Blue Dot(R) (OBD) project focusing on sustainable eating and in January 2019 the WHO publication re-affirmed the importance of increasing fibre (from all plant sources) in the diet for optimum health. To help professionals understand the evidence behind the headlines and provide practical resources to help make higher fibre and plant-based eating a reality for all, Alpro's Science and Nutrition team working together with leading nutrition and health experts, have produced a selection of fully referenced fact sheets, webinars as well as very practical infographics on boosing fibre intakes at breakfast time and taking a closer look at plant-based drinks. Eating patterns for health and environmental sustainability. A comprehensive review of the scientific evidence and national and international recommendations for consuming a diet that is both environmentally sustainable and healthy. Nutritional Considerations. A scientific review of the key nutrients contributed to the UK diet by meat and dairy and how a more plant-based diet can ensure these nutrients are not compromised. Other plant sources of key nutrients. The practical guide for dietitians providing current UK dietary intakes and recommendations, population groups at risk and extensive lists of plant sources of the key nutrients. Meal swaps. The BDA has taken some of the UK's most popular meals and demonstrated how they can be made more environmentally sustainable and more nutritious. Webinar November 2018. The recording of the live webinar on the BDA OBD® Sustainable Diets presented by three of the BDA members behind this invaluable resource: Tom Embury - Public Affairs Officer BDA, Dr Clare Pettinger RD & Lynne Garton RD. The role of plant-based drinks in the British and Irish diet. Our latest 8-page fully referenced fact sheet providing an overview of the latest literature for the role of plant-based drinks in the diet. Vanessa presents the evidence in context of our current eating patterns and how plant-based drinks impact on our nutritional and health status as well as the environment. Plant food sources of protein for optimum health & muscle status. A 4-page fully referenced fact sheet reviewing the latest scientific evidence for plant food sources of protein and their role in health and muscle status. This review provides the latest insights into plant protein quality, mineral bioavailability from plant-based diets, meal protein loading for optimum muscle protein synthesis and the environmental impact of our food choices. Practical infographics & top tips to inspire all to increase fibre intakes. Plant power your healthy diet with soya drinks. 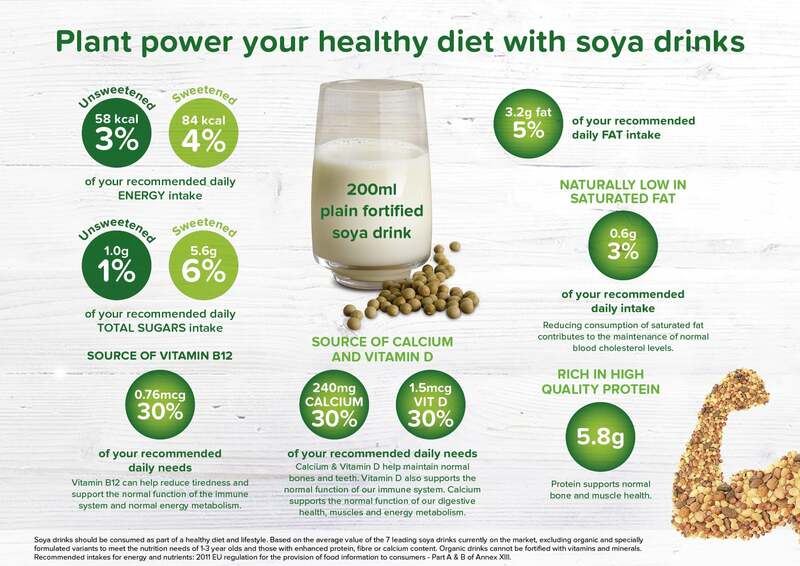 Soya drinks nutritional profile and benefits at a glance. The leading soya drinks on the market provide essential vitamins and minerals such as calcium and vitamins B2, B12 and D. Additianally they are a source of high quality protein and naturally low in saturated fat.